Are women’s fitness programs outdated? EVASON HUA HIN is opening of a culinary academy in partnership with Matthew Kenney Cuisine, well-known American integrated lifestyle brand founded to meet the increasing interest in living foods, and the art of raw food preparation. For Evason, Matthew Kenney Cuisine is “an ideal partner”. 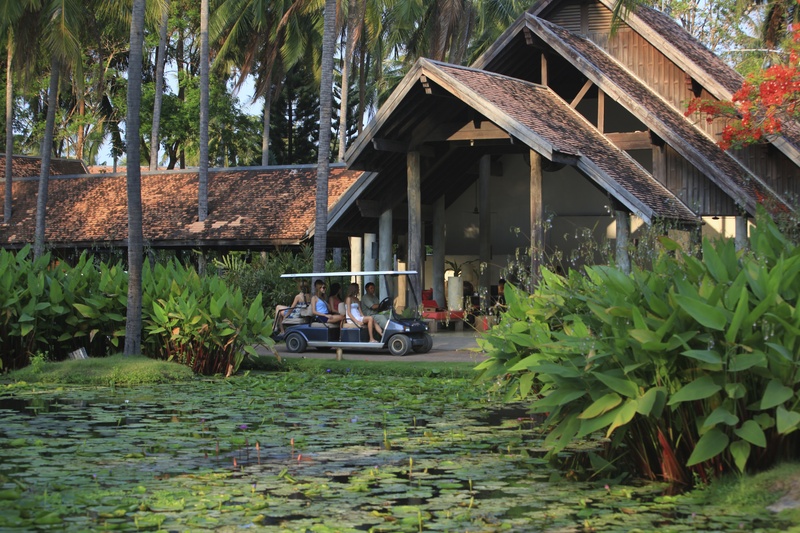 The new academic facility offers Asia’s first classically structured plant-based culinary academy, surrounded by 20 acres of rich, manicured tropical gardens, lotus ponds and access to the best plant-based produce in Thailand. Built upon Founder Matthew Kenney’s culinary training in plant-based raw foods cuisine, the new culinary academy offers month-long courses, as well as weekday and weekend workshops, which will be introduced later in the year. The curriculum centres on the use of whole, organic, unprocessed plant-based foods to achieve healthy, esthetically refined and flavourful cuisine. Core programing focuses on the “Fundamentals of Raw Cuisine” and offers students comprehensive training in the principles in the art of raw food, as well as cooked plant-based cuisine classes that further the modern, creative approach to preparing nutritious foods. Its programs are structured to provide students heightened new techniques, enabling them to execute and innovate raw and cooked plant-based cuisine at the highest level. As part of an exclusive enrollment package, students are provided with accommodations at the resort. The intimate class structure and personalized instruction at all Matthew Kenney Culinary Academies allow for hands-on experiences within a custom designed, commercial living foods kitchen. Every aspect of the culture, operation, and facility are developed to foster the company’s mission to advance cutting-edge living cuisine. As at other locations, the faculty and staff are hand selected and trained in the latest culinary and educational techniques, priding themselves on continually advancing their own creativity and knowledge. Evason Hua Hin, located 25 km south of Hua Hin, is famed for the Thai Royal Summer Palace, and provides calming views over the Gulf of Siam. A fully-immersive destination, Evason Hua Hin recently underwent a major enhancement program, refurbishing all 196 guest rooms, suites and pool villas. The resort complements the Matthew Kenney Culinary approach to holistic living with its Six Senses Spa featuring popular wellness programs including Discover Yoga, Yogic Detox and Yogic Sleep and a dedication to sustainable practices including water use reduction, waste management, sustainable purchasing and carbon emission reductions. For more information on academy training, visit Matthew Kenney Culinary’s website or contactadmissions@matthewkenneycuisine.com. 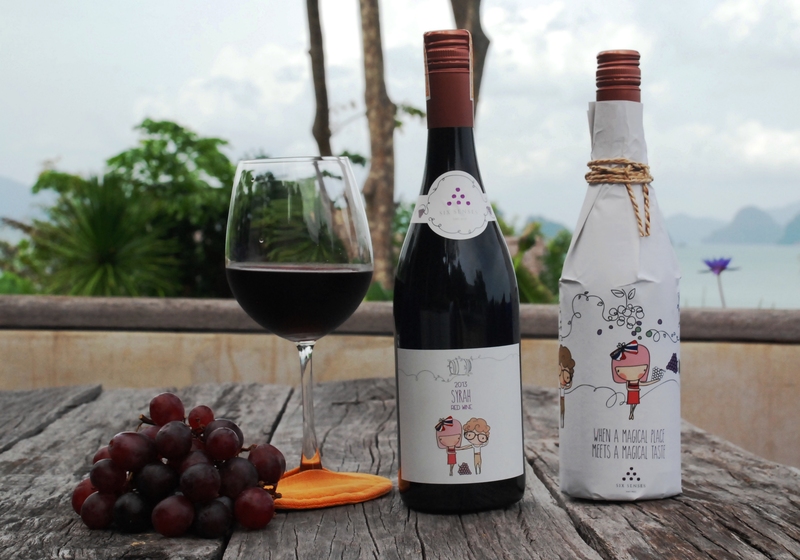 SIX SENSES YAO NOI is introducing its third private labeled wine, the Syrah Red, on Aug. 11, 2015. The event, to be held at the resort’s Hilltop Reserve restaurant, will be attended by winemaker Nikki Lohitnavy of GranMonte Estate, who will personally introduce the Syrah Red to guests and resort team. The launch starts at 5:30 pm as a highlight of the General Manager’s Cocktail Reception. The next evening, Aug. 12, a Thai wine and barbecue dinner will be held on the beach beneath the stars. Guests are encouraged to dress casually and comfortably to join Executive Chef Anthony Reynolds and Nikki on the beach as they cook and pair seven Gran Monte wines with freshly caught seafood. The event starts at 6:30 pm with sparkling wine at sundown and is priced at 3,000 THB. Later in the week Executive Sommelier Christian Maier will present a unique Champagne tasting set on a deserted island accompanied by delicious nibbles. Guests will be guided by the resorts’ wine expert in one of the most unforgettable surroundings at sunset. Several informative wine-tasting events paired with Thai food plus a wine game dinner will also be held at the Hilltop Reserve. They feature great wines and delicious food set against the dramatic backdrop of Phang Nga Bay. The Master Thai Wine is priced at THB 1,500 per person; Champagne Tasting event is 1,800 THB per person; and the Wine Game Dinner is 4,000 THB per person. Winemaker Nikki Lohitnavy is one of the youngest and most dynamic oenologist in Thailand. She studied her craft at Adelaide University in Australia, where she was the first Thai student to take the intensive four-year course, which involves both viticulture and winemaking. She graduated with honors and received several awards including the Fosters Wine Estates Prize for excellence in winemaking. The Syrah Red is produced solely for Six Senses Yao Noi, and has resulted from collaboration between Six Senses Yao Noi and Nikki. The sustainably-produced wine is crafted from estate grown fruit of the Asoke Valley, and aged in French oak barrels for eight months. It shows blackberries and blackcurrant fruit with a hint of pepper spice and is perfect with Thai food. 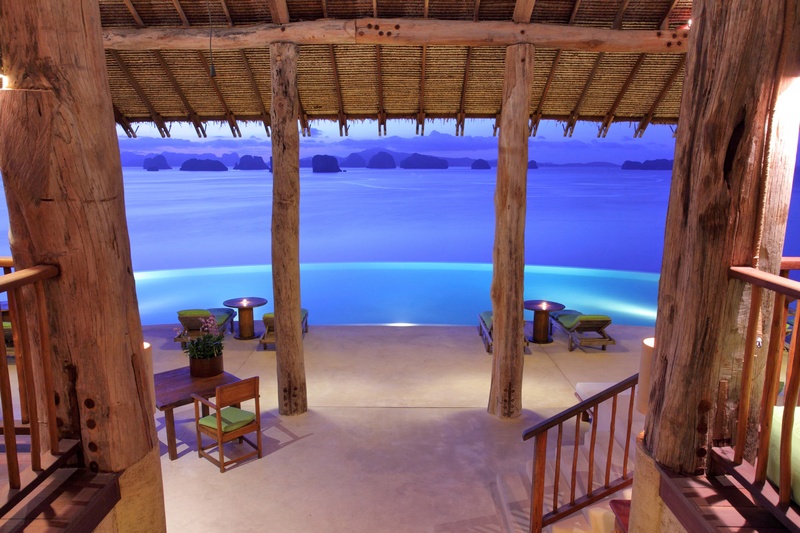 Its freshness blends perfectly with the natural lifestyle of Six Senses Yao Noi. TRIPADVISOR, the world’s largest travel review site, recently honoured SALA Resorts and Spas and sala boutique properties with the 2015 TripAdvisor Certificate of Excellence award. The properties singled out for excellence were: SALA Samui, SALA Phuket, sala lanna, sala rattanakosin and sala Ayutthaya. SALA Phuket also received Hall of Fame recognition, given to resorts which have earned a Certificate of Excellence for the five consecutive years. The TripAdvisor award is given to establishments that consistently achieve outstanding traveler reviews on TripAdvisor.com. To qualify for the Certificate of Excellence, businesses must maintain an over-all TripAdvisor rating of at least four out of five, have a minimum number of reviews, and be listed on TripAdvisor for at least 12 months. “SALA Hospitality Group would like to take this opportunity to thank our valued guests for their positive reviews and constructive feedback and is looking forward to living up to the elevated expectations that come with this recognition as well as continuing its drive to be the holiday destinations of choice in Thailand,” said a SALA spokesperson. 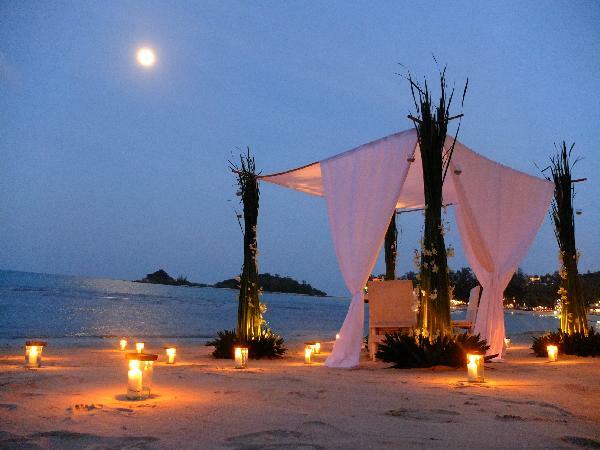 In other SALA news, SALA Samui is offering a Romantic Dinner on your own private beach. For more details, call 66-7724-5888. At SALA Lanna in Chiang Mai, you can relax on the banks of the Ping River for afternoon tea, featuring scones, sandwiches and other delicacies served with freshly brewed teas from 1 to 5 pm daily. Price – 580 THB for two people. THAILAND-BASED international real estate developer Country Group Development (CGD) and Four Seasons Hotels and Resorts have announced plans for a luxury hotel and residential project situated along Bangkok’s Chao Phraya River. The development, designed to offer a world-class waterfront experience and set a new standard in luxury, will be home to the new Four Seasons Hotel Bangkok at Chao Phraya River and Four Seasons Private Residences Bangkok at Chao Phraya River. The hotel will include more than 300 rooms and suites as well as offer world-class amenities and dining. 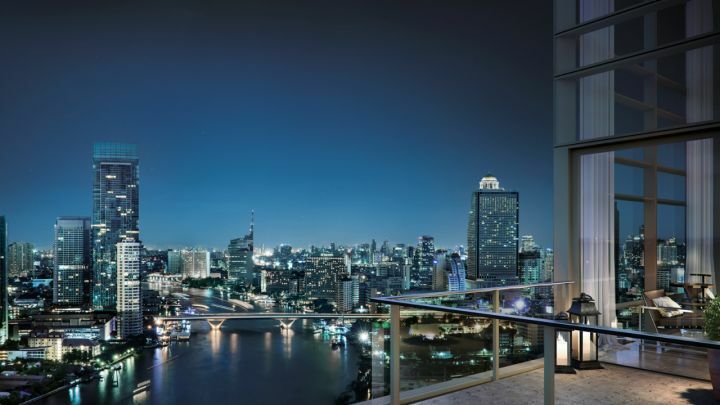 The private residences will consist of more than 350 all-corner luxury units in a 73-story tower, offering uninterrupted views of the Bangkok city skyline. The low-density, mixed use development is a significant contribution to the revitalization of Thailand’s greatest urban waterway. Its waterfront extends more than 350 metres (1,150 feet) across 14.2 acres. “Through our collaboration with Four Seasons, our aim is for Chao Phraya Estate to redefine the waterfront experience in Bangkok and Asia,” said Ben Taechaubol, CEO of Country Group Development PCL. “Our contribution to the revival of the Chao Phraya River and skyline of Bangkok reflects our passion and respect for our city’s rich culture and history and our desire to see it be renowned as one of the greatest urban waterways in the world,” he said. “Bangkok continues to be a destination of choice for business and leisure travellers and this property will embody our commitment to innovation and exceeding the expectations of our discerning guests,”said Michael Crawford, president, Asia Pacific, Four Seasons Hotels and Resorts. In designing the concept for Chao Phraya Estate, CGD appointed internationally acclaimed masterplan and design consultants Hamiltons International, alongside consulting interior design group BAMO to design an iconic property that maximizes the best of waterfront living as a legacy to future generations. Four Seasons Hotel Bangkok at Chao Phraya River and Four Seasons Private Residences Bangkok at Chao Phraya River are due for completion at the end of 2018. The residential sales gallery has been set up on the development site at Soi Charoen Krung, 64 Charoen Krung Road, Yannawa Sathorn. For further information, visit www.chaophrayaestate.com. DUSIT HOTELS & RESORTS is marking the grand opening of its Dusit Thani Krabi Resort with a 50% discount on a bed and breakfast package from now until Oct. 31, 2015. Its rooms are spread out in eight low-rise buildings amid tropical gardens and ponds, offering views of the resort’s mangrove gardens. They are available in one king and two-bed configurations. 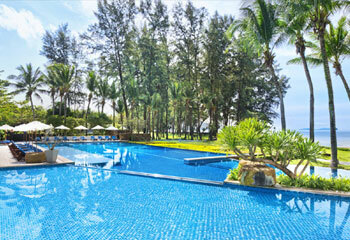 Dusit is also offering several packages at all its hotels and resorts in Thailand, China, Maldives and Dubai. Its Bonus Night Package, for example, offers an extra night fee when you stay two nights. This package is available until Sept. 15, 2015. IF YOU HAVE A BAD HEART OR HIP PROBLEMS, don’t even think about it. Walking from the Information and Display Centre to Hell Fire Pass, about an hour’s drive from the River Kwai in Thailand, is a nightmare of steep, unforgiving concrete steps that seem to go up forever. From the Information Pavilion, the walk takes 10 or 15 minutes – if you’re in good shape. If you’re not, take the alternative route that requires the services of a van and driver. But if you want to stick it out, be prepared for some pretty challenging climbs. 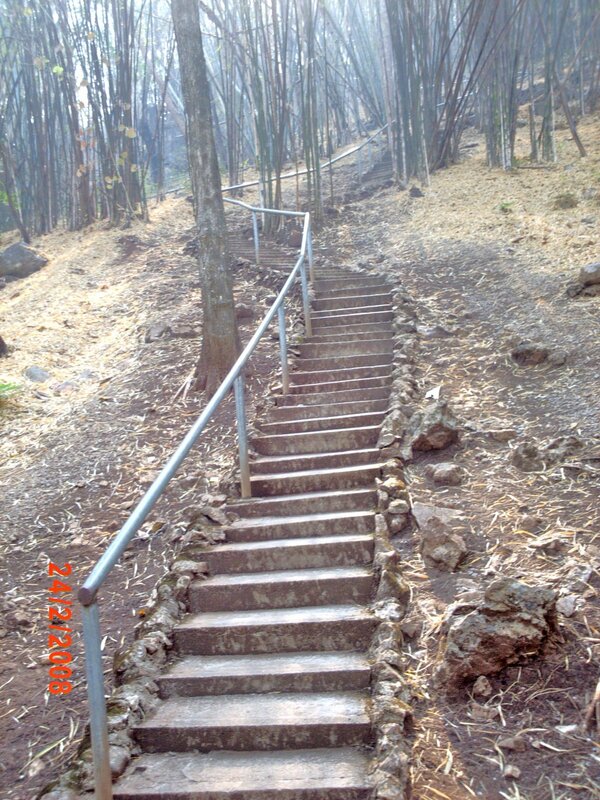 In the toughest areas, you’ll find metal railings on both sides of the steps to help you along before reaching a rocky level path and then, another wall of stairs before descending finally down a long twisted flight to the pass, itself. Voices cry out from the past as you walk through the pass – a rose inserted in a drill hole by relatives of POWs, a broken compressor drill still stuck in the rock where it was left 65 years ago, and here and there, a wooden tie peeps up from the gravel. In the middle of the pass a tree has taken root and grown up in the middle of the rocky railway bed. That’s when you find out that there are only two ways to get back – by the way you came or by van. “Walking back is easier,” I was assured by one of the tour guides. Unfortunately, I believed him and was barely able to stagger back on my own. On the way back, I kept thinking of the prisoners-of-war who had to make their way back to camp after an exhausting shift under brutal conditions day after day. If you pause along the way, as I did, you can hear the birds and cicadas in the bamboo grove that has grown up around sections of the pathway. Hell Fire Pass was the longest – and deepest – along the entire length of the Thai-Burma Railway. It was also notorious as one of the worst places of suffering and cruelty faced by the POWs. The cutting was planned by Japanese engineers and carried out by the prisoners. It became known as the Hammer and Tap, because of the constant sound of hammering by the POW crews. who kept working long into the night by light from torches and fires, reminding more than one POW of a scene out of Dante’s Inferno. Their suffering is retold in a series of display panels in the Information Pavilion, built by the Australians after the war to document the sufferings of their servicemen who toiled at Hell Fire Pass. As you enter the pavilion, you are asked to take your shoes off. This is customary in Thai homes and temples. This is how one of the panels describes the work of the POWs: “If you stood at the top of the cutting, you could see fires at intervals of about 20 feet and the shadows of the Japanese, wearing Foreign Legion caps, moving around and beating the POWs with sticks. Many of the POWs were almost naked under their slouch hats, moving rocks around and hammering. The shouting and bellowing went on all night …. ” Work gangs were divided into three groups: Moving gangs, who cleared the earth; tap men, who drilled deep holes into the rock for blasting and explosives; and rock rollers, who cleared the rubble after each blast. Men worked all day, even through Monsoon rains, stopping only at midday for lunch. And later, when the Japanese decided to speed up the process, the gangs were required to work through the night. “Each morning, as the POWs arrived on the job, the Silent Basher, a guard, went down their lines, never uttering a word, punching the POWs in the head and face to make sure they were suitably motivated for the day’s work,” Gunner Keith Harrison, 4th Anti-Tank Regiment of Australia, was to write later. Work on the pass started on April 15, 1943 – ANZAC – the day Australians remember their war dead. Many of the POWs fell sick and died. Reinforcements had to be brought in, continuing to work under “Speedo” conditions until the cutting was completed and rail-laying teams took over. Hundreds of men were working at the site at any given time. Interestingly, the Japanese paid the POWs working on the railway. Hourly rates were low and payment at the whim of the Japanese. The POWs used the pay to buy extra food and contribute to camp funds to buy medicine and food for the sick. The POWS were led to believe they were going to rest camps. Even sick POWs were asked to fill their quotas. By the time they reached their camps, most of the POWs were in poor shape and their possessions stolen from them. In fact, they had to build the camp and start work on the railway almost immediately. “All we knew was that they want a work party to go to Thailand. It was supposed to be a land of milk and honey – with plenty of food and very little to do,” wrote Geoff O’Connor, D Force. A STUDY INDICATING why British women don’t work out as much as they’d prefer surely reflects the sentiments of U.S. women, says celebrity trainer Holly Perkins. The research revealed that 75% of women in the United Kingdom want to exercise more, but they’re discouraged for fear of being judged by others. The women surveyed worried about how they would look while exercising in front of others, their inexperience in personal fitness, and the idea that they’re putting themselves first, ahead of their children. Even today, most fitness programs women come across neglect important parts of the average woman’s mindset, she says. Many gyms have spinning and other classes targeting women but they lack the comprehensive aspect so many women are searching for, she says. “There are plenty of women who frequent gyms but I think the culture of most of those places are framed by a male-dominated attitude, which is more comfortable blocking out ‘gym time’ in their schedule,” says Perkins, who recently released a home-exercise system designed specifically for women called baladea (www.baladea.com), with regimens she developed to fuse fitness and wellness exercises. Perkins describes what works for women in a fitness program. Fun. “No pain, no gain” is definitely a man’s attitude. As women, we are not afraid of a healthy muscle burn, sweating and commitment – we’re designed to carry babies for nine months, and then deliver them, after all. However, we are much more relationship-oriented, and we thrive in positive feelings. The way to a woman’s heart in fitness is fun. Purpose. For men who work out, the activity is almost a purpose in itself. There is a sense of accomplishment in lifting heavy weights and “gettin’ it done.” Women want to shine; we want to look and feel like we never felt possible. We want to be in touch with who we are, and fitness synergized with over-all well-being can do that. Steps. It’s good for anyone starting a fitness program to have a blueprint for what they’d like to achieve, and steps for improvement along the way. For those who are inexperienced, an introduction and a detailed plan enables time for the mind to ease into the process. Confusion or uncertainty is a waste of energy, and implementing new workout phases allows women to maximize our effort. Synergy. If you think women don’t need weights, think again. Resistance band training increases your power and revs your body’s fat-burning engine. We also want to be lithe, supple and physically elegant. Yoga helps us reshape trouble zones, and something I call “flow” optimizes flexibility and beautifies posture. And, when we are done, we can enjoy a calm that reinforces our motive for inner and outer beauty, leaving us with an energizing relaxation.